Product prices and availability are accurate as of 2019-04-07 23:15:20 EDT and are subject to change. Any price and availability information displayed on http://www.amazon.com/ at the time of purchase will apply to the purchase of this product. 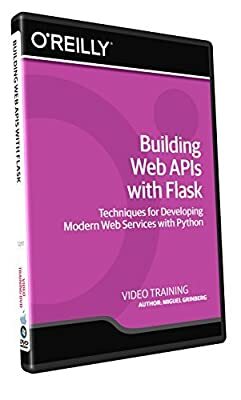 If you want to build web services and APIs, this video course shows you how to do it with Flask-the popular web framework that's small, lightweight, and powerful. Using detailed examples, Miguel Grinberg shows you how to create APIs line-by-line, starting with the implementation of a basic CRUD (Create/Read/Update/Delete) service. You'll also learn how to create APIs for internet-enabled devices, authenticate API clients, use testing techniques, and simplify advanced features such as pagination, caching, rate limiting, and asynchronous tasks. In the process, you'll become familiar with all of the core features APIs must have, including requests, responses, resources, resource representations, resource links, and error handling. If you're an experienced developer familiar with Python and relational databases, this video is for you. It also serves as a detailed extension of the API chapter in Grinberg's book, Flask Web Development. Miguel Grinberg has over 25 years of experience as a software engineer. In his current position at Rackspace he spends most of his time contributing to open source projects in the OpenStack ecosystem. He blogs at http://blog.miguelgrinberg.com about a variety of topics including web development, robotics, and photography. Learn Building Web APIs with Flask from a professional trainer from your own desk. Visual training method, offering users increased retention and accelerated learning Breaks even the most complex applications down into simplistic steps.